As a Maroochydore local, I’ve been a little jealous when hearing of the fabulous gourmet street food that you find today in larger cities. One such place in particular comes to mind in Brisbane at Hamilton. The ‘Eat Street Markets’ pop every Friday and Saturday night from 4.00pm to 10.00pm, and Sunday through winter from 11.00am to 3.00pm at Northshore on Hamilton Wharf (right next to Portside) with delicious international street food, ice cold wine, boutique beers and live entertainment. The incredible array of food that my friends on Facebook and Instagram have taunted me with has been truly mouth watering. 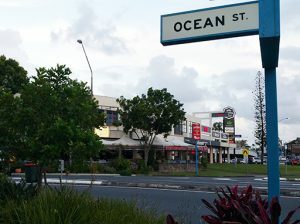 Thankfully, our local Sunshine Coast Council recently gave the green light to a similar ‘Eat Street’ food style market, in the heart of Maroochydore, on Ocean Street. According to a recent story by 7 News Sunshine Coast, Ocean Street is set to get ‘even funkier’ with an ‘Eat Street’ style food stall market, made up of old converted shipping containers. Very hipster if you ask me, but the food is sure to be more than worth enduring all the manicured beards that are certain to be on display at the markets every weekend. 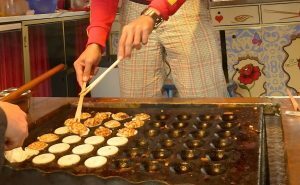 Other similar markets boast an incredible range of foods and culinary marvels, from incredible burgers and wood fired pizza slices, to mind blowing, street style Asian food that will set your taste buds alight. Mexican food stalls for your nacho aficionados and taco nutters; Greek, Indian, and more seafood than I could ever stomach. 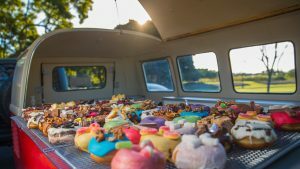 And of course, for those with a sweet tooth, there’s an incredible range of desserts; from gluten filled and gluten free doughnuts, to French crepes and Dutch Poffertjes. 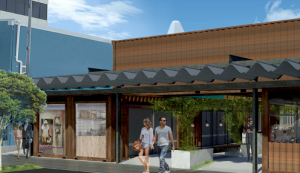 A recent story on MySunshineCoast reported that Division 8 Councillor Jason O’Pray had said the development application was unusual, the idea of converting old shipping containers into a food outlet would certainly draw some attention. “As the traditional main street CBD of Maroochydore, this new eatery will provide a wide selection of dining options within a casual and contemporary setting,” Cr O’Pray said. 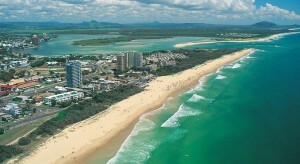 Planning Portfolio Councillor Christian Dickson said it was encouraging to see the Sunshine Coast Planning Scheme was providing the right conditions for developments to prosper in the right locations. “The planning scheme is continuing to provide support to ongoing development applications and this type of food outlet will certainly add to Ocean Street’s intended urban laneway character and vibe,” Cr Dickson said. It is, of course, very early days, as construction on the area has yet to begin, but an existing building in Ocean Street is said to be in the line of fire to be demolished to make room for this fantastic cultural project. It’s a very exciting time for us all here in Maroochydore, with an incredible wave of development breaking upon us, in terms of residential precincts, community, and lifestyle. Let’s hope we have even more reason to visit Ocean Street soon.